The ANBUG Career Award for Outstanding Science was awarded to Prof. Chris Ling, University of Sydney. The announcement was made last week the ANSTO User Meeting held last week at the National Centre for Synchrotron Science, Melbourne. Chris’s major neutron scattering achievements have been in the area of crystallography, utilising a mixture of single crystal and powder diffraction methods. As appropriate he has supplemented these studies with inelastic neutron measurements. He makes extensive use of the neutron scattering facilities at the new OPAL research reactor. Chris is an extremely productive researcher having published thus far over 130 papers and has a H-index of 23. Highlights of the work he has conducted within Australia include the study of the unusual spin-gap behaviours in the hexagonal perovskites Ba3BiMO9 ( M = Ru, Ir) and the study of potential cathode materials for sodium batteries. In addition to his outstanding research, Chris has played a significant role in promoting Neutron Scattering in Australia and in the wider Asian region. In particular, he is a past president of ANBUG, he was the Chair of the very successful AOCNS meeting held in Sydney in 2015, and he is currently Secretary of AONSA – in this last role he has made a significant contribution to a number of AONSA Neutron Schools. The ANBUG Career Award was awarded to Dr Robert Robinson for outstanding contributions to neutron science spanning an entire career. The announcement was made last week the ANSTO User Meeting held last week at the National Centre for Synchrotron Science, Melbourne. 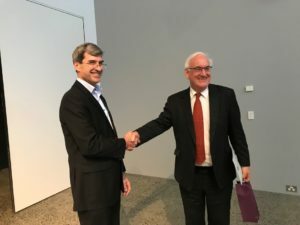 Dr Robert Robinson for his leadership in building and the transformation of Australia’s Neutron Scattering facilities at the OPAL reactor over the past 15 years, into one of Australia’s most significant research centres and a leading international neutron scattering research facility. 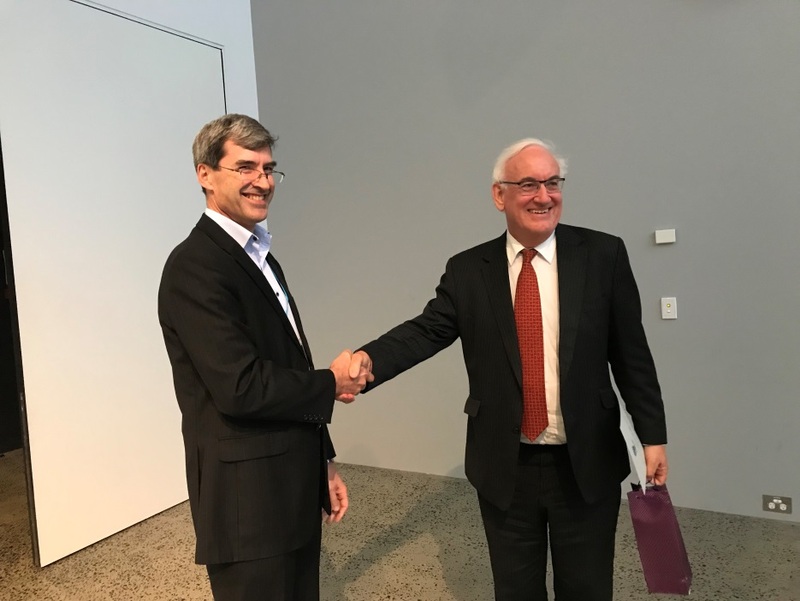 The establishment of the Bragg Institute at ANSTO as a centre of excellence for neutron scattering was, in many ways, made possible by the singular vision, commitment and collaborative spirit of Dr Robert Robinson. Dr Robinson acted as its Head from its inception in 2002, through its establishment until 2016. The Bragg Institute initially oversaw the construction and commissioned eight instruments. The Super-Science-funded Neutron Beam Expansion Project, which increased the number of instruments to 13, was conceived, developed and financed under Dr Robinson’s leadership; it was successfully completed in 2015. The establishment of the Bragg Institute, the recruitment of staff, the construction and commissioning of a suite of state-of-the-art instruments and sample environments, formation and operation of a user office, development of research policy and strategy and maintaining partnerships could only be achieved by a highly competent, strong leader who could draw the best from everyone. ANBUG president, Ian Gentle congrulations Dr Robert Robinson on the being awarded the ANBUG Career Award for 2017. 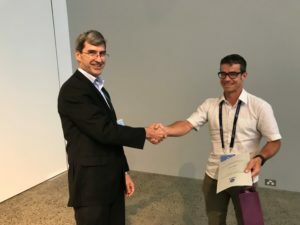 ANBUG Career Award – for sustained contribution to a scientific subfield, or subfields, using neutron scattering techniques. ANBUG Neutron Award – for outstanding research in neutron science and leadership promoting the Australian neutron scattering community. This year we would like to recognise the achievements of our users by awarding one or both of these awards and nominations are now open. Nominations should be submitted to the ANBUG Secretary (kwo@ansto.gov.au) by close of business on Friday 3rd November, 2017. ANSTO and AINSE will fund two Australia-based PhD students or post-doctoral fellows to attend the 38th Berlin Neutron School to be held March 1 – 9, 2018, at the HZB campus in Berlin. The school will comprise lectures about the production of neutrons, neutron scattering in general, the different neutron-scattering techniques, overviews of neutron science at various facilities, hands-on experimental sessions, and a students’ poster session. If you wish to apply for one of these positions at the school and for ANSTO/AINSE travel support to attend the school, please apply directly via the school web site (http://www.helmholtz-berlin.de/events/neutronschool) (Deadline, October 15, 2017), with an e-mail to Ashley Hill (ashleyh@ansto.gov.au) that you wish to be considered for the travel support. Following the success of previous meetings in Sydney, Delft, Paris and Lund, we are pleased to announce that Neutrons and Food will be returning to Sydney next year on 16th – 19th October 2018. 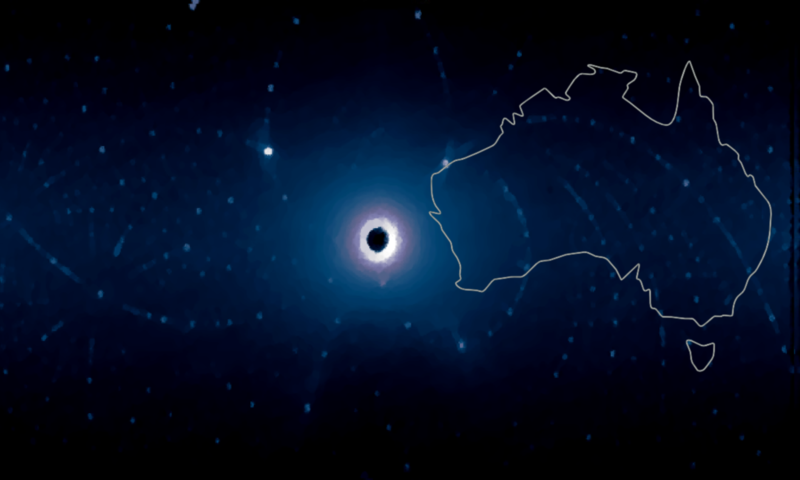 The first ANSTO User Meeting provides a unique forum for members of the Australian Synchrotron and Australian Centre for Neutron Scattering communities, as well as users of ANSTO’s Centre for Accelerator Science facility, to come together and showcase their cutting-edge research. This user-led meeting is organised by members of the Australian Synchrotron User Advisory Committee (AS UAC) and the Australian Neutron Beamline Users Group (ANBUG). Abstract submission is now open and will close 6th October. It will be held at the National Centre for Synchrotron Science in Melbourne. The School will be held at the Materials and Life Science Experimental Facility (MLF) of J-PARC. J-PARC is one of Japan’s flagship research facilities. ANBUG is hoping to be able to offer some travel scholarships, will be confirmed in September.